Departing the Spaceport’s ELS launch complex near the city of Sinnamary at the planned exact liftoff time of 11:08:10 p.m. (local time in French Guiana) on September 10, Soyuz deployed its two passengers after a flight of just under three hours and 47 minutes. This included the propulsion of Soyuz’ first three stages and two burns of its Fregat upper stage. In post-launch comments at the Spaceport, Arianespace Chairman and CEO Stéphane Israël noted these are the ninth and tenth Galileo spacecraft orbited by Arianespace, joining a constellation that ultimately will consist of 30 satellites. Tonight’s passengers for Soyuz, named Alba and Oriana, are the latest FOC (Full Operational Capability) satellites, which are to operate in Galileo’s Orbital Plane A – one of three orbital planes being populated by the European navigation spacecraft. The European Commission is managing and funding Galileo’s FOC phase, during which the network’s complete operational and ground infrastructure is being deployed. Design and procurement agent responsibilities have been delegated to the European Space Agency (ESA) on the Commission’s behalf. Arianespace is set to launch two more satellites with Soyuz by year-end, before handing this task over to Ariane 5 beginning in 2016 with a launch carrying four satellites. One more Soyuz and two more Ariane 5s will continue the activity in 2017-2018. “Galileo keeps us busy, and Arianespace is very proud to be the reference partner of this European flagship space program,” Israël said. After expressing his appreciation to the European Commission and ESA for their confidence, he noted that 2015 is an important year for Arianespace at the service of European institutions, with 11 payloads to be orbited utilizing the company’s family of Soyuz, the heavy-lift Ariane 5 and lightweight Vega. 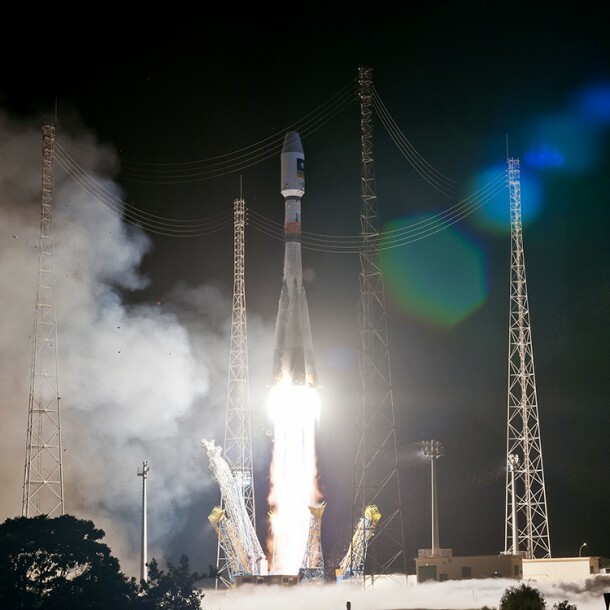 Soyuz’ flight with Galileo’s Alba and Oriana satellites occurred during the eighth of 12 Arianespace missions planned for 2015 – which will be a new record for the company’s launcher family. Its preparations at the Spaceport included the first use of the new FCube fueling facility, which is part of improvements in French Guiana to increase launch capacity, flexibility and schedule robustness. Israël acknowledged those who contributed to this latest Arianespace success, including the Russian federal space agency, Roscosmos, and the country’s industrial partners; along with the European support companies; the French CNES space agency, and Arianespace own teams. The next Arianespace mission is scheduled for September 30, using an Ariane 5 to orbit two telecommunications satellites: Sky Muster for Australia’s nbn and ARSAT-2 for Argentina.